Home / Posts Tagged "onion"
Magazines and radio shows are already gushing about springy greens recipes, but if you’re eating seasonally in the Upper Valley, winter food is still on the table. And with the gorgeous snow, that’s fine with me. You can get the main ingredients for this one-pot locally grown dish at the winter farmers market as well as a local grocery. Get a bag of local spinach and make a salad to go alongside your braise if you’re feeling springy. This dish uses classic ingredients from northern and eastern Europe – pork, carrots, potatoes, cabbage, and caraway seeds (these are the seeds in rye bread). My Danish great-grandmother’s version uses sauerkraut and prunes instead of cabbage, carrots, and caraway. Her recipe is tasty, but a little intense and only makes sense if you have extra sauerkraut sitting around. The version I’m sharing here uses fresh cabbage instead. Play around with different root vegetables and spices or try it with sauerkraut if you want. Don’t panic about this long list ingredients. You probably have almost all of them just gathering dust somewhere in the cupboard, right? No need to go buy any of them if you don’t have them. – Quarter the cabbage. Slice away the core/stem area. Slice thinly across the grain. – I peeled the carrots because the skins looked a little weird – but I saved the skins for stock! – Chop the onions and mince the garlic. In a Dutch oven (5-quart pot with a tight-fitting lid), heat 1 tablespoon oil over medium-high. Generously sprinkle pork with salt. Cook until well browned, about 3-4 minutes per side. Remove pork. Add remaining tablespoon oil, onion, cabbage, carrot, garlic, bay leaf, and thyme; season with salt. Don’t worry about the brown pork bits stuck to the pot. 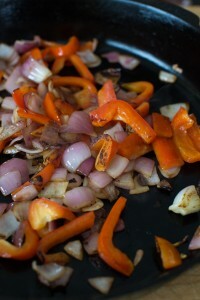 They’ll release with the moisture of the vegetables and add to the flavor. 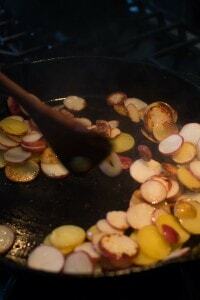 Cook, stirring frequently, until vegetables have browned somewhat, about 8 minutes. Add vinegar, caraway seeds, mustard, and 1 1/4 cups water/stock/wine; bring to a boil. Add potatoes, and reduce heat to a simmer. Cover, and cook until cabbage and potatoes are almost tender, about 15-20 minutes. Return pork to pot; cover, and continue cooking until pork is just cooked through and potatoes are tender, 10 to 15 minutes more. Grind a generous amount of black pepper over braise, sprinkle with chopped parsley (if using) and serve. This is tasty as leftovers. There are several options for providing mid-day sustenance for your school-aged children. Many schools have excellent school lunches, but packing a lunch to send to school is sometimes necessary. If packing an exciting, healthy brown bag lunch that comes home empty at the end of the day is one of your New Year’s resolutions – here’s some help. This blog post is from our Everyday chef partner, Elena Gustavson from RAFFL, and is filled with tips to becoming a better “lunch crafter”. The dreaded brown bag lunch of yesteryear, filled with bologna sandwiches and mealy apples is a thing of the past! There are blogs and articles everywhere filled with recipes for creative, healthy lunches and a booming retail industry that has cropped up around lunch bags and bento boxes. Nowadays, even the school lunch line looks different from 10 years ago, where Farm to School programs abound in Vermont and National School Lunch Program Standards have transformed frozen tater tots and cardboard pizza into vibrant salad bars and balanced main courses carried by smiling children. Let’s face it. Nothing is perfect. As a nation, we are making strides in nutrition and health, but the strides are still uneven. Headlines have abounded in the last few years about children tossing their fresh fruits and veggies under the noses of their teachers or studies showing home packed lunches being less nutritious than the school. Add to this the time deficit that most of us seem to be working under and it seems no matter our good intentions, many of us struggle to model healthy eating for our children. Case in point, my kids have found a cold slice of cheese pizza in their lunch bags more than once this year. And I would like to remind you that I am a professional cook. So, in the spirit of “been there”, I offer a few tips that make “lunch crafting” easier on most days along with a tried and true recipe for a creamy chicken salad that with even a reluctant eater, won’t find its way to the bottom of a compost bin. Plan Meals: Yep, you know it’s true and I am here to tell you that it works. Nevermind that I am a menu nerd or that I have been known to make up fantasy meals for fun. Spending a bit of time in the beginning of each week to plan out lunches (and supper for that matter) is very helpful with time management, using up leftovers, creating balanced diets and saving money. There are millions and trillions (that is only a slight exaggeration) of free planners on the internet, from adorable printables to dense recipe databases on favorite food sites. And, when you are taking the long view of what your family is eating each week, the stress that can accompany serving a balanced meal 3 times a day, becomes less if your family is eating healthy over the course of several days instead. Be Prepared: It is very difficult to make home lunches if your pantry is bare and there isn’t a container in site. Take the time to purchase the ingredients you need, stock your cupboards or shelves with containers and bags for carry-in lunches and send your family off with what they need to eat well. If you can, carve out a space where you can make lunches with relative ease because it is easily accessible and well stocked. In our house, there is a 2X2 foot counter sandwiched between a drawer with my containers, jars and baggies and a shelf with our lunch bags, napkins and non-perishable snacks. Eat Seasonally: Even here in Zone 4 Vermont, there is a lot of fresh eating food available that is at the peak of its flavor (translating into “delicious”) and is less expensive than when you try to hunt it down out of season, (say, like, strawberries in January). Use the Vermont Department of Agriculture’s harvest calendar to help you know what is available locally. Create a Habit: Get into a rhythm of planning and making lunches so that it becomes a part of your routine. Are the mornings usually hectic, then carve out a few minutes in the evening to start thinking about and setting up lunches for the next day. Are you an early bird? Take the quiet time in the morning to get lunches started and have them ready by the door before the kids head out for school. No matter how you do it, there are bound to be bumps along the way, but stick with it and before you know it, your consistency will give birth to a healthy habit! Think Outside the Box: You do not have to eat a sandwich to have lunch. I have packed up meals that were re-purposed from supper two nights before or a very basic mix of cheddar cheese squares, sliced apples, roasted pumpkin seeds and whole grain crackers. It is easy to get caught up in the mundane of day to day, but try mixing things up a bit and offer your family some unusual choices. Their interest and desire to try new things just might surprise you! Does all this mean that you will put together elegant, healthy AND delicious lunches five days a week, receiving rave reviews from friends and family? Eh, probably not, but you can inch closer to lunch stardom if you plan ahead, create habits and persevere, even when you hit a bump in the road. Cook’s Notes: Including yogurt in the dressing, gives this chicken the slightest bit of tang, making the salad more interesting. The lower calories from the light mayo and yogurt means this is all about the chicken, the protein and the vegetables rather than the dressing. Pairs well as a sandwich filling or on top of greens or both! Feel free to omit the nuts and dried fruit if you have a finicky eater and if you prefer a drier chicken salad, start with just a third of the dressing and add more as you like. Excellent recipe to make ahead and keep refrigerated for a few days. No time to poach chicken? No problem. Leftover chicken works fantastic! Fill a large pot ⅔ full of water and bring to a boil. Carefully add the chicken breast or tenders and bring back to a simmer over medium high heat. Cover and simmer uncovered for 20 minutes (breasts) or 15 minutes (tenders) or until a thermometer reads 165 f. Remove chicken from pot and let sit for 5 minutes or until cool enough to handle. Shred the meat with a fork and refrigerate for 30 minutes or until cooled. In a medium bowl or large measuring cup, whisk together the mayo, yogurt, mustard, lemon juice, vinegar and maple syrup. Add the salt and pepper to taste. In a large bowl, pile the shredded chicken, celery, bell pepper, onion, nuts/seeds and dried fruit. Pour on the dressing and gently fold together until mixed. Cover and refrigerate until ready to serve. This is the start of soup season at my house. Soups are comforting and can be super easy, like this amazingly delicious 3 ingredient soup (there are 3 main ingredients, but there are some spices and cider that you’ll need, too). The original recipe is from Ina Garten, but I’ve made a few adjustments to reduce the spice level. A trick I use to make this a 15 minute soup is to pre-cook the squash. When I have too many squash rolling around the kitchen counter (CSA share back log, irresistible sale at the farm stand, garden abundance, etc. ), I cook all the squash at once and then freeze what I don’t need. That way I can just pull the pre-cooked squash from the freezer and add it right into the soup. Heat butter, olive oil, onion, and curry powder in a soup pot on low heat for 10-15 minutes, until tender, stirring occasionally. Add squash, apple, salt, Garam masala, cider or water and bring to a boil. Reduce heat, cover and cook over low heat for 20-30 minutes or until very tender. Remove from heat. Puree with blender, food processor, or immersion blender. 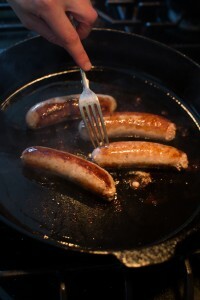 Return to heat and thin with cider to desired thickness. Serve and enjoy!